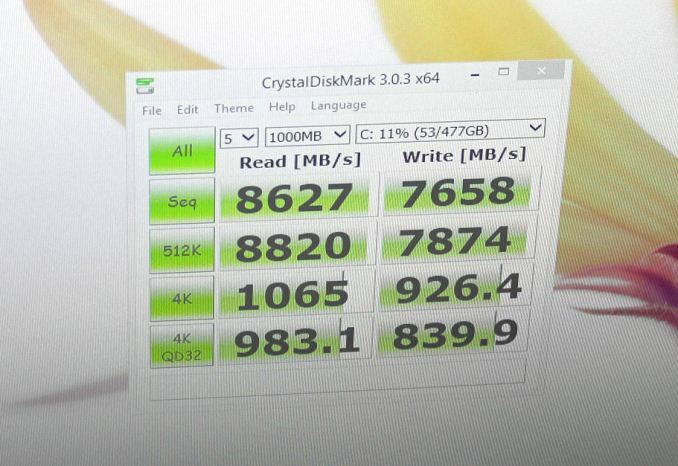 Continuing with our CES SSD coverage, Plextor released a new M6e Black Edition PCIe SSD at the show. Unfortunately, the Black Edition offers nothing new in terms of the hardware or firmware design and it's merely a normal M6e with fancy black 'n red heat sinks. The controller is the same Marvell 88SS9183, which is a PCIe 2.0 x2 design without NVMe support, and the controller is coupled with Toshiba's 19nm MLC NAND. 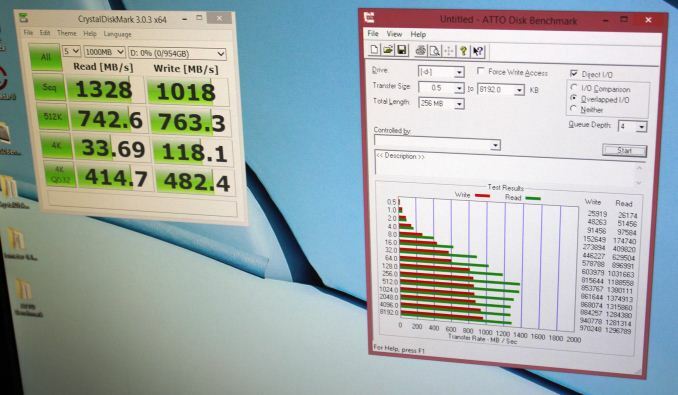 Performance is rated at 770MB/s sequential read and 625MB/s sequential write with up to 105K random read and 100K random write IOPS, similar to the original M6e. I can see the reasoning behind the Black Edition since the M6e was a very plain green PCB design and especially gamers with side window cases will appreciate the new design, but otherwise the Black Edition doesn't bring anything new to the market. The drive will be available later in Q1'15 and will be sold exclusively through NewEgg. Pricing is about $1 per gigabyte for the 128GB model and the larger capacities will be somewhat more cost efficient (exact pricing is to be announced). We never got around to review the original M6e due to some testbed issues, but I now have a new testbed and all capacities of the M6e Black Edition, so stay tuned for the full review (you may even get a sneak peek of our new 2015 Client SSD Suite). Along with the M6e Black Edition, Plextor is also releasing a 2.0 version of PlexTurbo. The software is similar to Samsung's RAPID in the sense that it uses system RAM to cache IOs and boost performance. The 2.0 version brings increased RAM allocation (25% or up to 4GB) in addition to better optimized caching algorithm that provides even higher performance. I'll also be taking a look at the PlextTurbo software in the upcoming M6e Black Edition review. Moving on to upcoming releases, Plextor also demonstrated the successor of the M6e i.e. the M7e. The biggest change is the new controller (Marvell 88SS9283), which doubles the amount of PCIe lanes to four, but it's still a PCIe 2.0 design that relies on AHCI (i.e. no NVMe). Performance wise the M7e presents nearly 100% improvement, at least in sequential speeds. The drive is still in development, so there aren't any finalized specifications yet, but the drive should be available in H1'15. Lite-on, Plextor's parent company, had the enterprise version of the M7e called the EP1 in the suite. The controller is the same Marvell 88SS9283, but the drive has capacitors for power-loss protection and the firmware has also been optimized for enterprise workloads (i.e. more emphasis on consistency rather than peak performance). 480GB and 960GB capacity options are available in M.2 22110 form factor with performance being up to 1.5GB/s read and 1.2GB/s write. Plextor/Lite-on has been developing a TLC NAND based SSD for quite some time now and the release is nearing every day. Dubbed as the M6V, the drive will utilize Marvell's new 88SS1074 controller with LDPC error correction for increased endurance. The NAND will be Toshiba's A19nm TLC. The schedule is still a bit open from what I heard, but the drive should make an entry to the market around mid-2015 timeframe.